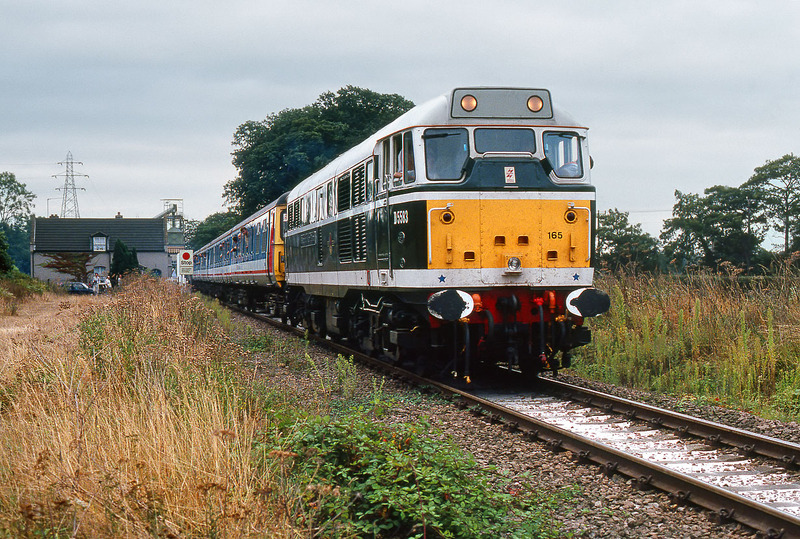 31165 Stratford Major Depot leaves Middleton Towers on 14 September 1991 with the 2G53 17:00 Middleton Towers to Kings Lynn special, one of a number of trains run under the banner of the 'Network Gala Day 1991'. The stock unusually consists of EMU 312715, and hidden behind the stop board protecting the level crossing in the background is 31196. 31165 was an obvious choice of motive power, as its repaint into original green livery, complete with pre TOPS D5583 number, had given it minor celebrity status.